A tent meeting was held in June, 1911 at the southwest corner of the intersection of Park and Center Street. 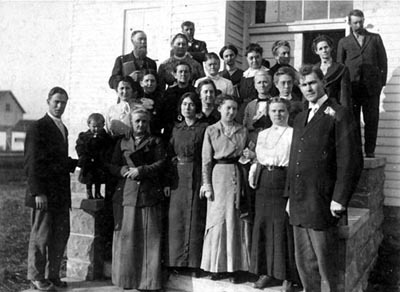 The non-denominational congregation that was formed from this meeting first assembled on June 25, 1911 in the Woodmen's Hall, on the second floor of the Grange Store on the northwest corner of Park and Elm. Many of the charter members moved their membership from the Church of Christ meeting in the Carroll schoolhouse, south and east of Gardner. The Carroll congregation may have been meeting as early as 1871, when the Sidney Gay family moved into the area from DeWitt County, Illinois. 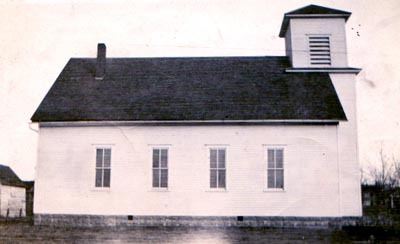 On June 15, 1912, the congregation met to discuss the purchase of a lot and the erection of a meeting house. The congregation subscribed $1,535 for the project. A building committee was selected, including the following members: Tom Turner, J. H. Meng, N.L. Glover, C. L. Dille and E. Y. Gay. The property was deeded to three trustees, C. L. Dille, W. H. Frakes and Fred Hermon, with the understanding that the property would be deeded to elders and their successors, in the event that elders were selected. The building was erected by Cramer and Eyerly with lumber supplied by the Gardner Lumber Company. The building was completed in the fall of 1912. Under the name "Church of Christ", we, the undersigned, met at Gardner, Kansas, Johnson County, June 18th, 1911, in order that we from this time onward might keep the ordinances of the Lord's House as He has commanded us to in the New Testament, which New Testament we take as our only rule of faith and practice. Today, the congregation continues to follow the same pattern, set forth in the New Testament.